In 1919, Riverside Boat Club celebrated its 50th anniversary with a banquet attended by over two hundred at the boathouse. Dinner was followed by music and a speech by Harvard crew coach Bill Haines, after which Cambridge Mayor Quinn made a presentation to George Faulkner, former professional sculler, Harvard coach and talismanic Riverside figure. Faulkner’s great great-granddaughter Susan Waldman and her husband Dennis recently visited Riverside hoping to swap information about him. The Faulkner family, with six year old George, left Ireland in 1847, the worst year of the “Great Hunger.” They came to Boston by way of St. John New Brunswick, Canada where they had been quarantined during a typhus epidemic, finally settling in East Boston. Rowing soon became part of both George’s leisure and professional life. In 1856, at the age of fifteen, George took part in his first race, an impromptu affair between stevedore boats for a side bet of $10. 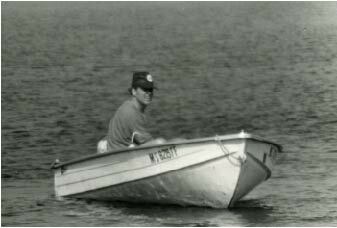 Two years later he participated in his first regatta on the Charles River in the six-oared Shamrock. At the age sixteen or seventeen, George began rowing for a Commercial Street company that offloaded cargo from incoming ships. It was his job to race other companies’ rowers out to ships arriving in Boston harbor to secure the job of unloading them for his company. Faulkner might row upwards of 40 miles a day securing contracts for his employer. He would eventually purchase the company and run it well into his 80s. 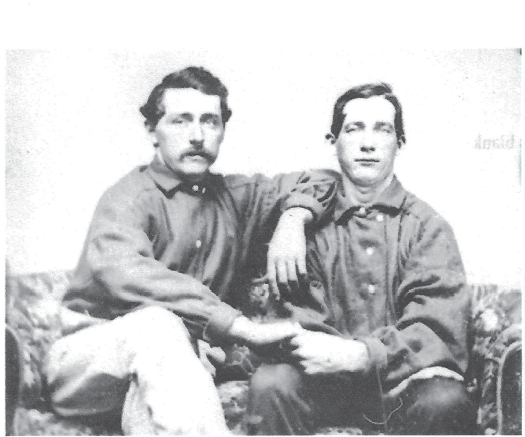 George Faulkner (right) with his father Cary (left), circa 1857. Popular interest in rowing boomed following the Civil War. The region of the country that was most enthusiastic about professional rowing, and the wagering associated with it, was New England. Under the protocols of the day, Faulkner was considered a “professional” because he earned his living on the water. He was one of the most successful rowers in both sweep boats and singles. In 1876, the city of Philadelphia scheduled a regatta on the Schuylkill River as one of three sporting events (the other two being riflery and yachting) as part of the nation’s Centennial celebration. Faulkner entered the pairs competition with Charlestown’s Patsy Reagan, with whom he had been racing since 1868. Rowing out of South Boston at the time, he and Reagan defeated the vaunted Ward brothers and a celebrated pair from England to win the competition, collecting $1,000 and the title of world champions. The popularity of rowing was so high in this era that Faulkner’s 1877 match race with Michael Davis, an Irish immigrant sculler and rowing innovator from Portland, Maine, attracted 30,000 spectators to the Charles. Faulkner was strong but Davis was a rowing innovator. He shocked Boston by defeating Faulkner. Buoyed by his victory, the following year Davis challenged any Boston sculler to race him over a four-mile course with a turn for $1,000 and the New England championship. Patsy Reagan, Faulkner’s 1876 Centennial Regatta pairs partner, was undefeated as a sculler that season and a hometown hero. He accepted Davis’ challenge. A longshoreman of few means, Reagan hoped to profit not only from winning the purse, but from betting what little money his family had and every penny he could borrow on the race. Sponsored by the Old Colony Railroad, their race and three others that season were re-located from the Charles River to Silver Lake in Kingston, south of the city. The railroad had invested in recreational property on the lake and was hoping to promote sales as well as boost weekend ticket purchases. Anticipating unprecedented interest in the October 8, 1878 race, it scheduled a dedicated excursion train with several extra cars to transport competitors, spectators, and gamblers to the venue. Reagan started strongly. He had a solid lead past the viewing stands. As the boats came back into sight following the turn, which was beyond the spectators’ viewing range, however, they were dumbfounded. Davis had a clear lead. Reagan lost. The crowd rushed the ticket booths, suspecting that there was collusion or tampering of some type. Shots were fired as officials tried to control the angry mob. By the time a distraught Reagan had been safely escorted to a passenger car and the outraged spectators had boarded the excursion train back to Boston, it was quite late. In the falling darkness, the train ran into a freight car, throwing its cars off the track. Gaslights ignited a conflagration that killed nineteen people and injured nearly 200. Among the dead were Reagan and George Faulkner’s young wife, Margaret L. Brennan, mother of his two children. Reagan left a devastated young family. Six thousand people took off work to attend his funeral. After retiring from racing, Faulkner became one of the most respected coaches of his day, including controversial stints coaching Harvard crews. During the 19th century, college rowing, like the other principal football, baseball and track, was organized on a club basis. Each club elected a captain, who was responsible for team selection and arranged for coaching, usually by a graduate with financial support and direction coming from alumni. Coaching by professionals was generally eschewed, but as college rowing grew in popularity, the pressure to win mounted. Despite Harvard’s reminder that, “it had been once agreed by Yale and Harvard that professional coaches or trainers would not be employed,”(New York Times, March 17, 1880) Yale, having lost to Harvard in fifteen of their last nineteen dual races, hired sculler Michael Davis, to Harvard’s condemnation. His crews were victorious in 1881 and 1882 but Yale reverted to amateur coaching after it lost to Harvard in 1883. 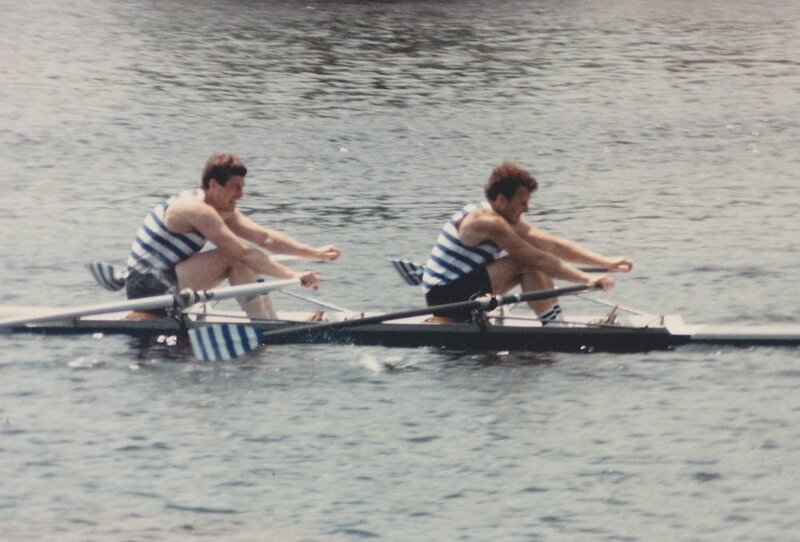 The direction of condemnation reversed in 1885 when Harvard captain James Storrow, to maintain a veneer of amateurism, arranged for George Faulkner to be retained in a vague capacity other than as coach, in which he would observe his crew and give him advice, which Storrow passed on to his rowers. The ’85 crew, its stroke revised by Faulkner, beat Yale but lost badly in 1886. Faulkner continued to appear in Harvard coaching launches into the 90s. Nevertheless, from 1886 to 1905 Yale beat Harvard in eighteen of twenty dual races. In 1894, after being thrashed by Yale, Harvard rowers gave up control over their program to the college athletic department. As the 20thCentury arrived, Riverside Boat Club was at its competitive peak. The Boston Globe’s rowing reporter proclaimed it “the first racing club in America.” Coached by Faulkner, its 1903 senior eight, repeating as New England champion, was considered the best the club had put on the water to-date. The Club’s J. Peterson, also coached by Faulkner, was a force in the senior singles. Cary (bow) and William Faulkner (stroke). Faulkner’s sons continued his Riverside legacy. To select the club’s intermediate singles entry for the 1908 nationals, it held a much publicized race among four members—reported to be the first time in Boston rowing history that there were four men in one club that were so competitive in their class. Up-and-coming Carey Faulkner, George’s son, defeated another second generation oarsman, Joe Ryan, prominent Cambridge boat builder William Davey’s son Frank, and J. Brassil to represent the club. Carey Faulkner won his event at Nationals. To celebrate, Riverside presented him with a gold watch and made him a life member. In 1909 he was the New England senior champion. Over the balance of the decade Riverside scullers were ascendant. Frank Davey won the New England singles championship in 1912. CareyFaulkner, his brother William, Davey, and Yale oarsman Henry Livingston formed a quad that won the U.S. National Championship in 1913. They repeated as champions the next year. 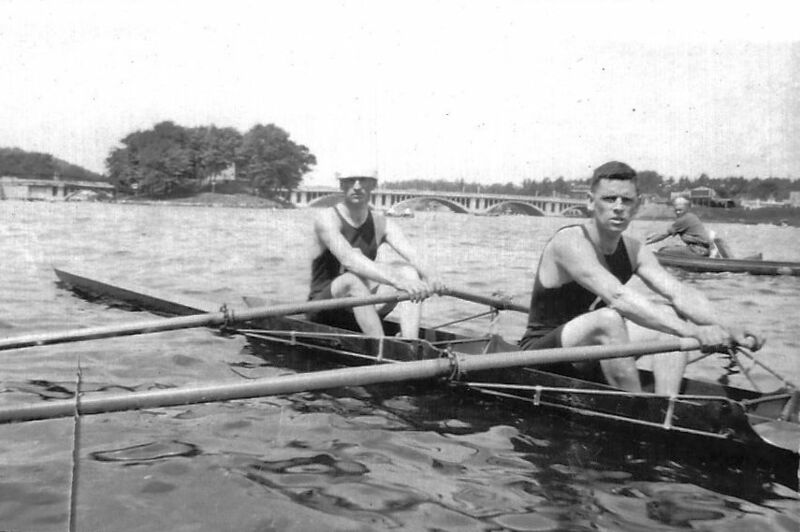 As Riverside’s 1919 50th anniversary testimonial to George Faulkner attests, he and his sons distinguished themselves during the fifty years period in which Boston rowing evolved from rough-and-tumble workingman’s competitions dominated by professionals into an amateur sport conducted by well-organized clubs and embraced by elite colleges. Among Riverside Boat Club’s best oarsmen during the late 1930s and early 40s and certainly its most colorful were three brothers from Sneen, County Kerry, Ireland, Steve, Jim and Tom Casey. In keeping with rowing’s long association with pugilism, Steve, Tom and two other brothers had been successful professional boxers and wrestlers in Ireland, but the seven siblings’ first love was rowing. They raced victoriously in the 1930’s and it is said that five of them would have competed for Ireland in the 1936 Olympics had they not been disqualified for taking prize fight money. In 1938, Steve “Crusher” Casey, recently arrived in Boston with Tom and Jim, won the world heavyweight wrestling championship at the Garden, a title he would hold until 1947. Looking for a place to row, the three gravitated to Riverside, the Boston club with an Irish as well as a boxing pedigree, where they were soon known as “the famous Caseys.” In 1940, they issued a challenge through the Boston Globe to any four in the country to race them on the Charles. They were to be joined by another brother once it was accepted. After watching the Caseys train, however, no one responded until Union Boat Club’s Russell Codman, Jr., a silver medalist sculler in a recent national championships but now 45 years of age, agreed to a singles race. The Boston Globe sponsored the event, offering $1,000 in prize money. Former Harvard oar Governor Leverett Saltonstall put up a cup for the winner. The principals raised $2,000 in stakes. Arranged for November 10, the race attracted an enormous crowd, reported to have included young Jack Kennedy. Tom Casey, age 25 and famed for his blistering cadence, finished first, Jim was second, Steve third and Codman fourth. Tom is said to have gone on to win every race he entered. As for Crusher, it is testimony to his popularity on both sides of the Atlantic that his statue stands today in Sneen, while in this country his bars, Casey’s in Boston and Casey’s Too in Hull, were favorite watering holes for locals, Irish immigrants and rowers alike. Riverside Boat Club’s boathouse turned 100 years old last month. Its construction is closely linked to the transformation of the Charles River into a park system at the turn of the 19th Century. To that point, the river’s Cambridge shore between the Brookline (B.U.) Bridge and Watertown was a series of tidal marshes and mud flats, punctuated by industrial sites like The Riverside Press and the adjacent Cambridge Electric Company, between which was wedged Riverside 1891 boathouse, Harvard’s coal yards, and the Watertown Arsenal. The river rose and fell at least five feet with the tides, sweeping through bridge pilings like a mill race. 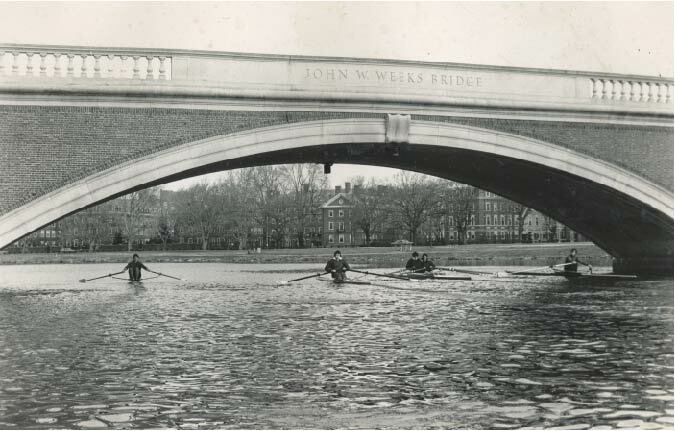 In 1905, a Riverside rower was quoted as saying that the club members “find occupation for their leisure moments fishing Harvard oarsmen out of the river” when they fetch up against the Western Avenue Bridge. “There was a time when a rescue meant the present of a new sweater or a pair of rowing tights, but now it is scarcely ‘Thank you.’ ” At low tide the river became too narrow for two crews to race abreast. In 1893, the City of Cambridge issued a plan to turn its riverfront into a recreational facility. It proposed that the river be dammed upstream from Craigie’s Bridge. The City would construct an esplanade between the West Boston (now Longfellow) bridge and the Brookline Bridge, a park and swimming beach above Brookline Bridge known as Captain’s Island (now Magazine Beach), and a tree-lined parkway to be called the Charles River Road that would run upriver past Harvard. To that end, the City acquired most of its riverfront by eminent domain in January 1894. The property takings caused the wholesale reconfiguration of the Cambridge rowing clubs. The Cambridge Casino, the forerunner of Cambridge Boat Club, was moved to a site opposite DeWolf Street to make way for the new parkway in 1895. The Harvard Rowing Club relocated the first Weld Boathouse to a new bulkhead in 1897. Harvard’s 1869 boathouse was demolished and its crews moved across the river to Newell Boathouse in 1901. The assembly of the right-of-way for the Charles River Road, which would be renamed Memorial Drive in honor of those killed in World War I following its transfer to the Metropolitan District Commission in 1923, was impeded by the presence of The Riverside Press, but in 1901 the City acquired this section of the alignment. The taking included Riverside’s boathouse, with the implication that the club would have to relocate to a new site. The transformation of the river into a recreational lake was completed with the construction of the Charles River dam, authorized by the legislature in 1903 and operational in 1910. Ironically, these waterfront improvements accelerated the demise of some Charles River rowing clubs. In 1906, Riverside Boat Club’s Cambridgeport rival, the Bradford Boat Club, moved its boathouse out of the way of the river improvements and the impending construction of a new Cottage Farm (the present B.U.) Bridge. The park commission served notice in the spring of 1909 that the club must either renovate its building or remove it from the park reservation. Bradford attempted to raise the money to rebuild within the new parkland but it was soon reported that, “It now looks as though (Bradford) have to vacate the location granted for the boathouse on the east bank of the Charles River just above the Cottage Farm Bridge owing to the lack of funds to meet the requirements of the park commissioners.” On the other hand, the BAA took advantage of the improvements. With the Charles River no longer tidal, in 1911 it gave up its floating boathouse on the Cambridge shore in favor of a new boathouse within the park just below the Grand Junction Railroad’s bridge at the site of the present Boston University boat house. The Cambridge park commission permitted Riverside to continue to occupy its boathouse while planning went forward for the Charles River Road. It was still in use in the spring of 1911. At about 1:00 A.M. on May 2, a watchman at the Cambridge Electric Co. spotted a fire in the building and sounded the alarm. The blaze was visible for miles and attracted a large crowd. At one point it spread to the adjacent electric company coal bins, but was soon contained. A Riverside member who tried to salvage club equipment had to be treated for smoke inhalation. In less than an hour, the building had burned to the ground. The club lost its boats, including four eights, two doubles, two four-oared workboats, two fours, twenty or more singles, as well as a number of whitehalls. The fire also consumed seventy-five banners and trophies, including those for national championships won four years earlier at Worcester and in Saratoga in 1894. As a result, only three of the New England Amateur Rowing Association banners hanging in the boathouse date before 1912. On May 5, a membership meeting instructed a committee to locate temporary quarters until a new boathouse could be constructed. The St. Alphonsus Athletic Association, which had recently opened a boathouse on the Boston shore just below the Brookline Bridge (August 2012 Riverside Press), invited the club to share it for the time being. Riverside considered purchasing Bradford’s old facility, but decided instead to build a new boathouse. On June 10, 1911, it held a fundraiser at the Scenic Temple, featuring moving pictures, music, illustrated songs and sketches. Winter quarters were rented on Massachusetts Avenue. By December, design work was underway and the Cambridge Park Commission was considering the club’s proposal for a site on a small spit of land between Pleasant and River Streets within the projected Captain’s Island Park. On February 12, 1912, Riverside was granted a twenty-year lease for the site. The City of Cambridge, the owner of the building when it was destroyed, settled with the club for $7,000. With these funds in hand, Riverside filed building plans with the City in April, 1912. Construction on the new structure, the club’s present boathouse, was quickly under way. It is not clear what rowing activities were carried on that season, but under president Thomas Riley and vice president T. F. Toomey Riverside continued to conduct boxing tournaments, including its annual tournament in Cypress Hall on Prospect Street. The new boathouse was completed in September 1912 at a cost of $7,600. Surrounded by mud flats that were soon to form the western end of Captain’s Island, it was a two-story, hip-roofed structure 50 feet wide and 70 feet deep resting of wooden pilings capped with concrete piers. The first floor housed the club’s boats as well as a training room, showers, lockers and a dressing room. The second was devoted to a large assembly and dance hall with a raised band area, still visible in its downstream corner, as well as a women’s room and a checkroom. The section of the Charles River Road and its supporting seawall between Western Avenue and River Street, the last to be constructed, were completed in 1914. Cambridge’s 1916 Atlas shows Riverside’s boathouse within the newly constructed riverfront parkland, adjacent to the men’s, women’s and boy’s bathhouses serving Captain’s Island.